Hotel Ca' Doge, Venice. 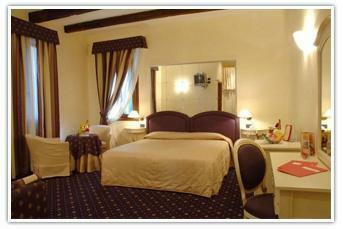 Ca' Doge Hotel Venice. Ca’Doge is situated in Piazzale Roma, in the heart of Venice, where mainland and islands meet. Here you have to park and get a boat, here buses come and vaporettos leave, here Venice and its calli begin. Ca’ Doge boasts a wonderful position, near the bus terminal, with a private closed circuit TV controlled car park, ideal for those who want to stay in a charming and prestigious hotel in Venice but don’t want to give up the convenience of the car. Ca’ Doge has been perfectly restructured and soundproofed, providing a cosy and easy-going atmosphere with high-standard furniture and services. Every room features free Internet access and a safe for laptops. We set at disposal of our guests 4 double rooms and 2 suites. They are all elegant, bright, large and perfectly soundproofed. Rooms are provided with air conditioning, TV Sat, fridge, direct line, hairdryer, Internet and safe for laptops.